A cheapo disaster / horror hybrid from Mexican schlockmeister René Cardona Jr., Terror Storm (also known as Cyclone) features horrid production values, atrocious performances, and a few former Hollywood types embarrassing themselves. A massive storm unexpectedly wallops the Caribbean near an unnamed island. Out at sea, a plane is caught in the turbulence and crashes into the ocean. A fishing boat capsizes, and a tourist boat is stranded without power. The rescue effort is slow in coming. 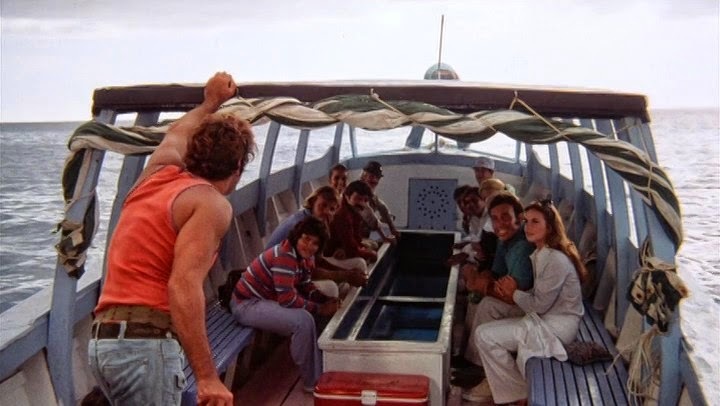 The survivors from the three incidents eventually converge onto the tourist boat, where water and food are running low, tensions are high, and the sharks are circling. Cardona Jr. made a small career out of budget disaster films in the 1970s, ripping off the decade-long obsession with the genre and cobbling together Mexican / Italian / Spanish co-productions with enough funding to attract a few fading stars. Terror Storm features a sudden Caribbean storm, a plane crash, cannibalism (with crunchier details in the longer "international" version) and a late-in-the-day shark attack, all filmed using bargain-basement techniques, stock footage, and oh-so-obvious not-so-special effects. To give credit where due, Terror Storm offers up several moral dilemmas worth mulling over, and the film's best moments are in the form of group discussions. Should a pet dog be treated with humanity and provided with precious water in dire circumstances. As the number of survivors on the tourist boat increases, the rationing of water supplies becomes an issue. And finally when cannibalism has to be considered, the topic is debated with some thoughtfulness. But the few good moments are comprehensively swamped by the prevailing awfulness. The cyclone scenes on the island consist of detached shots of rushing water that appear to be sourced from a documentary. When extras are hit with water, mostly on the crashing plane, it is laughably obvious that they are being hosed down. And once the sharks start munching, they feast on undefined slabs of meat wrapped in white cloth, simulating the human victims. Unsuccessfully. The dialogue is agonizing, and particularly during the on-island scenes, the words are delivered by actors with blank looks that scream for a mercy killing. Somehow, Arthur Kennedy (as a preacher), Carroll Baker (as the insufferable dog owner) and Lionel Stander (as a pompous tycoon) ended up in this mess, and all three ham it up with bewildering excitedness that does nothing to set their careers back on any sort of recovery. Needless to say, the set design is virtually non-existent. Terror Storm is a tedious exercise in waiting for the sharks to arrive and save the day.